When you are one of the best triathletes in the world, consistently finish in the top 10 at the World Championships, and have to defend an Ironman title, it’s no surprise that you have a constant target on your back. Our XRCEL athlete, and professional triathlete, Carrie Lester has proven time and again why she is a force to be reckoned with, no matter the starting line. After an impressive win at Ventouxman, Lester was able to pull through with a runner-up finish on the grueling Ironman France course. We checked in with Lester to find out what it’s like to handle such a technical course, while juggling some unexpected race day bumps in the road. Find out where Lester’s triathlon road leads as she begins her grind for another sensational finish at the Ironman World Championships. XRCEL: Heading into IM France as the defending champion, how did you handle the pressure? 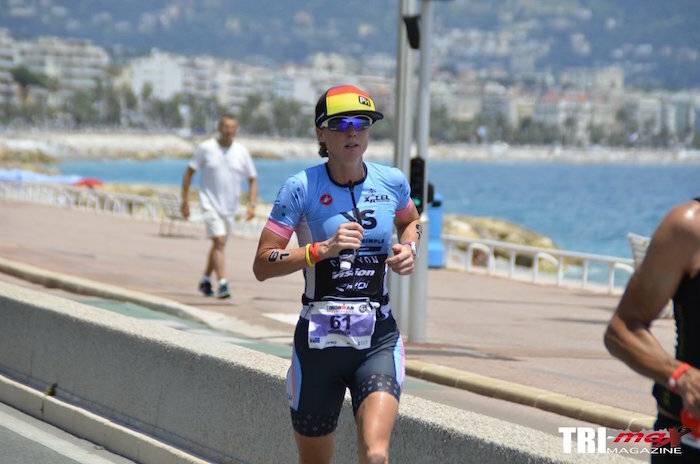 Carrie Lester: I really didn’t feel the pressure returning as the defending IRONMAN France champion. I always tell myself just to race the best I can and, wherever I place on the day, that’s all I can hope for. It would have been a dream to win again and, with family there this year, it would have been even sweeter, but unfortunately, I had to settle for second place this year. In your mind, what things went well and not so well during your race, specifically? I had what I feel was my best Ironman swim, sitting on the feet of the lead female the whole way, and it felt easy. I feel like I managed the bike pacing well, given how hard the course is, but where I went wrong was missing my fluid intake. It didn’t feel as hot as last year and I just didn’t take enough fluids, which I felt immediately on the run. Up until the run, everything had been going well. I spent the first lap of the run in a bit of a panic trying to figure out what was going on and what I needed to do and then spent another lap hitting every aid station. I kept taking my time to get any fluid and fuel I could while trying to stay cool. I had two XRCEL bottles with me out of transition, which helped along with the water, electrolytes, and trying to keep my body temperature down. By lap four, I felt better and was able to finish strong. I was a little disappointed I couldn’t run as well as I could have, but managing a tough run was a win for me. With such a tough and technical bike course, how do you make sure you are fully-fueled to stay strong during your ride and as you head in on the run? I feel like I nailed the fueling part as I never felt like I was bonking at any point during the ride. I consume XRCEL the entire bike course with two extra bottles in my special needs bag. I eat bananas, which I pick up at the aid stations as I have found that they settle my stomach. My big mistake was simply not drinking enough electrolytes and water. What did you take away from Ironman France this year? DRINK MORE! At least two more bidons! The last two years in Kona, you have bettered your top 10 finishes, 10th, and 7th. What do you think you need to do as you look to improve your performance this year? I’m pretty happy where I am now, and with another five weeks here in the mountains, in combination with two hard races, Alpe D’Huez and Embrunman, I will be in a better position to start the final training block in late August. I just need to manage the recovery from those two races so I can hit a really strong final preparation for Kona. Looking at your triathlon future, what do you see as goals, bucket list races, and how long do you see yourself putting your body through such a grueling career? This year, I wanted to do the Ironman France, Alpe D’Huez and Embrunan trifecta. I’ll try again next year, maybe. I would also like to do the Ironman 70.3 World Championships in Nice next year. I’m definitely getting a little slower with my recovery, but my body isn’t letting me down. I feel stronger than ever, so until I have lost the motivation, or something else comes along, (hint, hint, little feet) I will keep going.